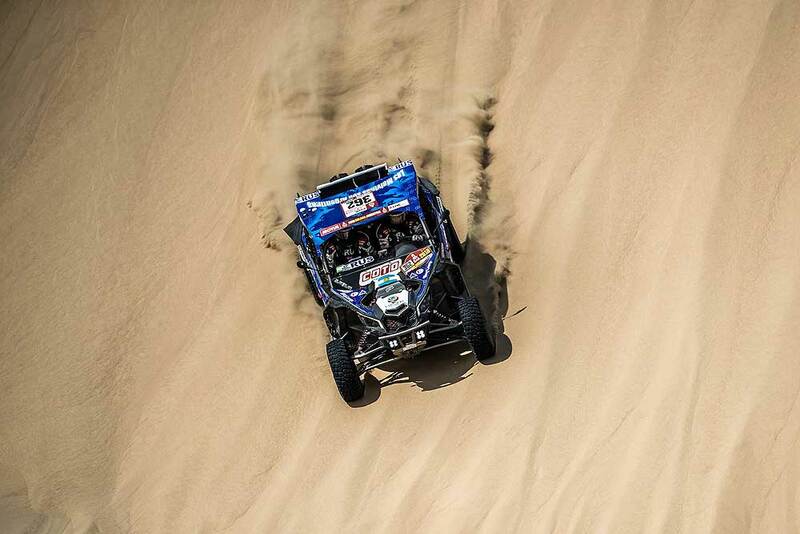 South Racing Can-Am Team’s Reinaldo Varela and Leonel Larrauri were firmly back on track through the demanding fourth special stage in the Peruvian deserts around San Juan de Marcona after a dramatic opening three days of the Dakar Rally for the new team. Varela and navigator Gustavo Gugelmin had claimed a fastest stage time on day two, before delays on the third stage, and the Brazilians entered Tuesday’s timed test fifth on the road in the SxS section alongside three cars in a four-vehicle beach start. Varela was the fastest of the ATV drivers through PC1 and maintained his pace through the next few checkpoints. The Brazilian had extended his advantage to 3:32 minutes after 100km and to 9:25 mins after PC2, but he lost time over the closing kilometers with a broken wheel rim and went on to finish the special in second position. He now holds third in the overall standings, 01:56:22 hours behind the leading Frenchman Patrice Garrouste. Leonel Larrauri and Fernando Imperatrice managed to reach the bivouac this morning after 24 hours in the car. They were granted a start position of 10th on the road in the SxS category, although they had incurred time penalties and were classified at the tail end of the overall rankings. The Argentines were running third through the first waypoint and maintained their stage position through 100k. They overcame two punctures to finish in an excellent third position. Juan Carlos Uribe and Javier Uribe Godoy were given a start time alongside a trio of Toyotas in their Can-Am chassis built by South Racing running with support from Can-Am Perú, Alsol, Friopacking and Chiawel Agro. They completed the day’s timed section in a time of 8hrs 13min 23sec after sustaining a broken drive shaft and slipped to second place in the prestigious new SxS category. "It was a good day today. We came back from a difficult stage yesterday," said Managing Director Scott Abraham. "Reinaldo was leading the stage at some points today but then, towards the end, he had a broken rim, which slowed him down. But he brought the car to the finish." "I take my hat off to Leonel. He spent 24 hours in the race car after his broken gearbox last night. He came into the bivouac this morning at just before seven and left just after nine to restart the stage and brought the car home in third position on the day. He will also have moved himself up in the overall rankings. He had two flat tyres early in the stage and had to drive conservatively until PC4, where we had neutralisation." "It was a difficult day for Juan Carlos (Uribe). He broke a drive shaft around kilometre 150 and brought the car home in seventh. But we will make sure that all the Can-Am Maverick X3s start the race tomorrow. There is still a very long way to go."